Are you a good writer? Do you want to see your writing published for all to see? Well here is your chance. 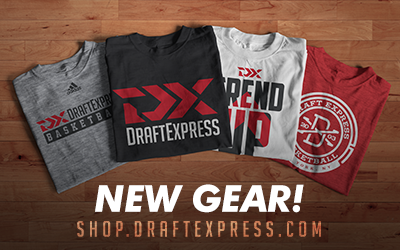 DraftExpress is in the process of building a solid base of staff writers so users can come to this site daily to see fresh content. Staff writers can possess a variety of skill sets: you can be a college basketball writer, a high school basketball writer, an international basketball writer, an editorial/opinion writer, or even a humor columnist. The connecting factor is your actual writing abilities, which will be independently evaluated by our experienced editorial staff. We do ask that in your writing you limit yourself to the knowledge and experience that you have, understanding that there is a difference between a staff writer and a staff reporter (our scouts). Remember, if you are an intelligent writer there is a place here for you to get your name out. DraftExpress is searching for intelligent correspondents to cover lesser known regions in which we do not already have scouts in place. The areas we are currently searching for are Eastern Asia, South America, Russia, and Africa. This is not a job for the casual fan, applicants must be well versed in the area they will cover and skilled in evaluating talent. We would prefer applicants with experience in doing so in the past, however this not a requirement and should not stop you from applying. The application process is understandably stringent. Also, if you believe you can assist us positively in areas where we already have coverage feel free to apply as well. DraftExpress is a non-profit site and thus we cannot pay our employees, nor do we promise to reimburse you for any expenses you may incur in working for us (including travel and time spent). So what can we offer you? Aside from the joy you should receive from helping out fellow basketball fans worldwide, we provide you with the free publicity inherent in a popular website. Efforts here can also be placed as experience on resumes if you are seeking a career in a particular business such as journalism. While our standards are very high, do not hesitate to apply if you feel that you are worthy.